72 Evaluators Needed at the Utah Career Center. 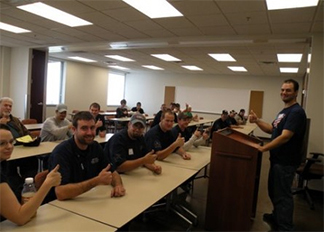 As part of its mission “to providing the best building construction tradesmen and women, and the best HVAC&R technicians in Utah,” the Utah Career Center, in partnership with UMCA members, continually strives to improve its classroom experience for its apprentices and instructors. This fall semester, 72 different classes are offered, and 250 students are enrolled. Classes are held evenings and Saturdays, around the workday, for both students and evaluators. The variety and span of classes mean opportunities for dozens of contractors to step up and influence the education of the next generation of tradesmen and women. Once these students complete the more than 1,300 hours of classroom and on-the-job training, they become holders of an Associate of Applied Science degree from Salt Lake City Community College, and an asset to UMCA’s contractor members. An orientation for evaluators will be scheduled for later in August at the Utah Career Center, 640 North Billy Mitchell Road in Salt Lake City. The fall semester runs from August 27 through December 17. To become an evaluator this fall, and help improve instruction at the UCC, contact Will Nickell, Director of Training, at will@ucctrades.com or Mike Beckstead, Assistant Director of Training, at mikeb@ucctrades.com. The Utah Career Center’s number is 801- 295-6198.